Home | Giveaway: Win a Black, White & Gold Clutch! Today just keeps getting better! Earlier we told you about the cufflinks being given away by Gregson & Buck, then we shared these forever boutonnieres, these fun bridesmaid sweatshirts, and now we’re giving away another awesome prize! For the latest in our wedding giveaway series, our friends over at ANGEE W., makers of the most beautiful clutch purses, are giving away a black, white and gold clutch purse to one lucky Emmaline Bride reader! This is a beautiful bag to carry on your wedding day or give away to your mom as a thank you gift. Since it features black, white, and gold, it goes with everything. Take a look & enter for your chance to win! This elegant lace clutch is made with a layer of thee embroidered tulle lace over ivory satin. Perfect for bridesmaids and mother of the bride and mother of groom in an champagne, gold or black dress! This is so versatile! The metallic purse frame can be customized in silver tone, light gold tone. Enter between 8/7/17-8/15/17 for a chance to win this black, white and gold clutch purse by ANGEE W.
Winner will be notified and announced on this blog post on 8/16/17. Winner will receive an email and must respond within 72 hours or new winner will be notified. P.S. Don’t want to wait? You can buy your clutch from ANGEE W’s shop here. 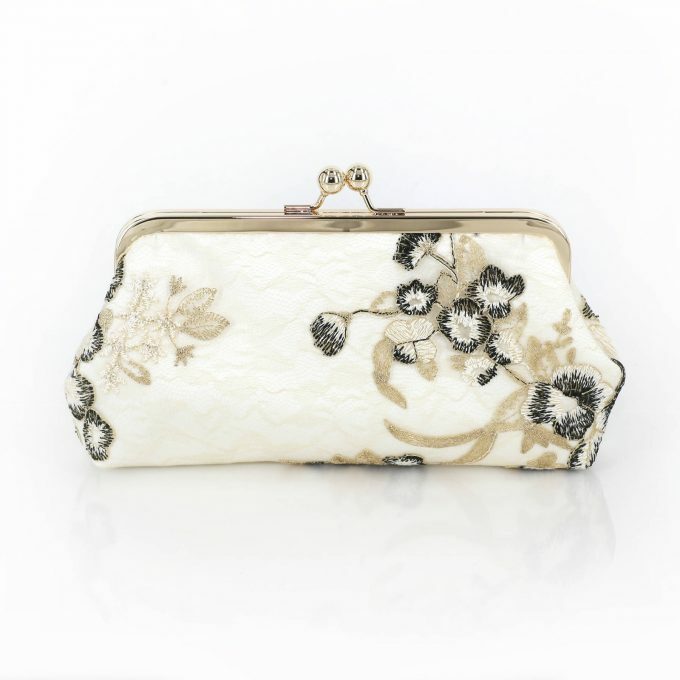 I love the Bridal Clutch with Magnolia Flower Vine and the ability to personalize it! 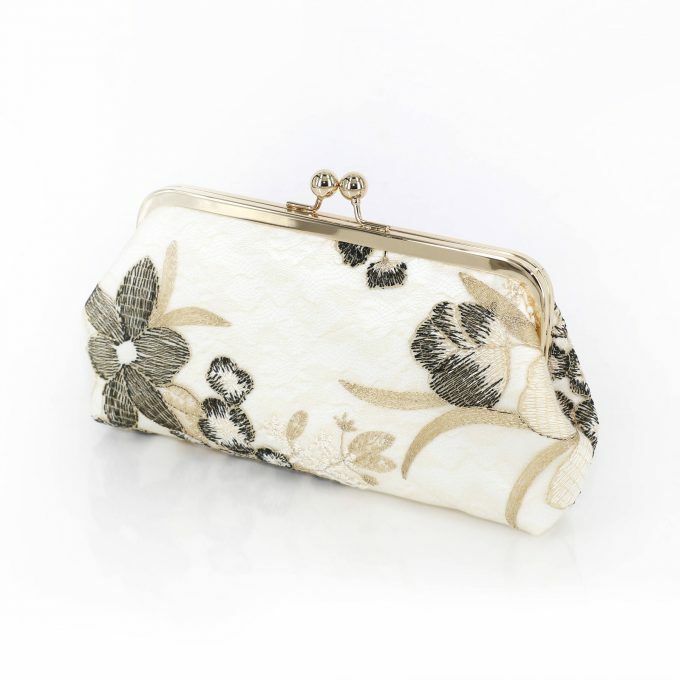 The bridal clutch with the magnolia flower is AMAZING; this Louisiana bride loves it!! Loving the black peony sequins lace clutch. I was wearing a dress with peonies on it when we got engaged, so anything with peonies just makes me melt! The photo personalized bridal clutch is so special! How wonderful it would be to have this on your wedding day! I love the Metallic silver and gold Alencon Lace Bridal Clutch in Ivory! The Black Rose Lace on Champagne Satin Clutch is soooo cute! Definitely would go with anything and look classy. My favorite is the Four Leaves Lace Wedding Bag QUATREFOIL. This grey bag would go with any dress and can be re-used over and over. I love the paisley peony clutch – the light pink is so pretty! This is awesome thanks for the chance to win!! I loved them all! I would choose 1 of each, but I will pick the Shimmery Purple Mauve Clutch Purse. I love the champagne and ivory !